Mother Nature's bounty brought indoors is reminiscent of warm summer days and beautiful meadows. 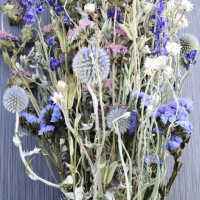 Whether you choose to give a dried flower bouquet as a gift, or to use in your own home or office, you can't go wrong choosing a Blue Bunch dried flower bouquet. 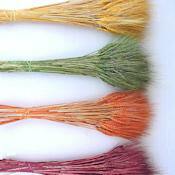 The quality is superior, and the grains and flowers are picked at their prime, air dried naturally, and then arranged to be attractive right out of the package. Just place in a vase, and your bouquet is ready to display. Taking some of Mother Nature's most brightly colored flowers, naturally air drying them, and then combining them into one bouquet makes a beautiful statement wherever it is seen. 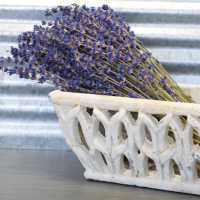 This long lasting dried bouquet will be a bright spot on a table as a centerpiece, in a bedroom on a dresser or to brighten up a laundry, powder room or den. Mother Nature's bounty brought indoors is reminiscent of warm summer days and beautiful meadows. 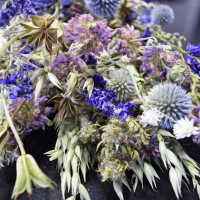 Whether you choose to give a dried flower bouquet as a gift, or to use in your own home or office, you can't go wrong choosing a Blue Bunch dried flower bouquet. 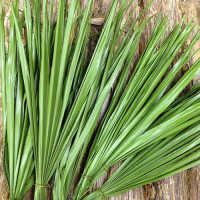 The quality is superior, and the grains and flowers are picked at their prime, air dried naturally, and then arranged to be attractive right out of the package. Just place in a vase, and your bouquet is ready to display. 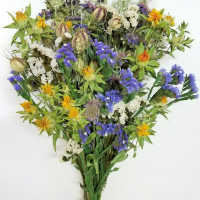 Each bouquet can also be broken apart to be used in wreath or swag making, the individual flowers and grains would also make a beautiful topiary or garland. 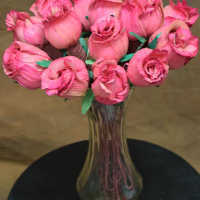 However you choose to use the Dried Flower Bouquet, it will be long lasting and bring joy for years to come. Taking some of Mother Nature's most brightly colored flowers, naturally air drying them, and then combining them into one bouquet makes a beautiful statement wherever it is seen. 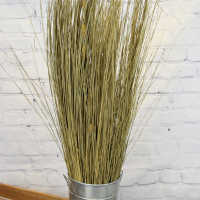 This long lasting dried bouquet will be a bright spot on a table as a centerpiece, in a bedroom on a dresser or to brighten up a laundry, powder room or den. Very large arrangement with lots of color, very impressed and love it. I was very pleased as well as surprised--the arrangements were much larger than I expected and well worth the money. Very fast shipping as well---very impressed and would not hesitate to order from DriedDecor again. Could not have been more satisfied. Excellent product. Colors are true to photograph. These were beautiful just how they came and they were in good shape when they arrived. 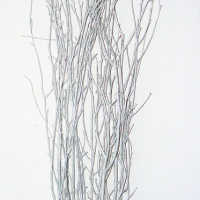 I purchased a couple to take apart to make bouquets and center pieces for our wedding. We got a lot of compliments on them. Overall great experience. Easy to order and check out. Packaging was good and didn't have any damage to any of the products we ordered. colorful, enough flowers. The flowers are beautiful and are going to look amazing in my fall outside wedding!!! They also look better in person than the do online. Thank you!! Exactly as described - shipping quick - just what we wanted - Thx! you had exactly what we were looking for! Beautiful color and texture selection. I used them in a wreath for an upcoming craft fair. I will definitely use your products again. Thank you. I really like these. 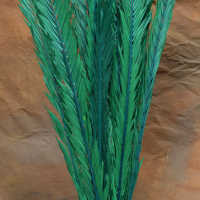 They were in perfect condition and can be used just as they came for arrangements. Fast shipping, great prices and overall great experience. About to order more product. 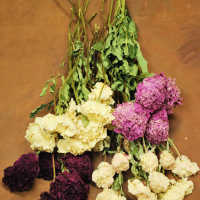 This was my favorite.. Great variety of dried flowers and a generous amount was included. Your flowers are beautiful. Very pleased to have discovered your company. 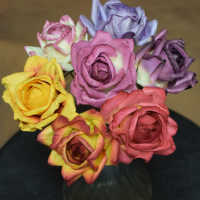 Beautiful, full arrangement with varied colors at a great price. 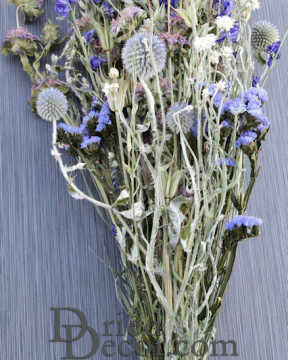 Nice to have an internet alternative for pretty dried flower arrangements! But all in all, PERFECT! What I received was very pretty and just like the photo. Service was fine. I received the product in a reasonable amount of time. Beautiful flowers, although some were a little flat. Nice variety. Loved the flowers. I used them for my wedding and I was not expected to have so much in the box! Very good customer service. They made sure it was shipped before the day of the wedding! The colors in this product were not quite in the blues, more purples and muted, good quality though. Good quality, but the thistle globes are not really blue as shown. 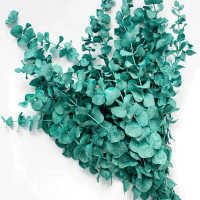 They are really like a mint green. Not as blue as pictured, but kept it anyway. Having never ordered dried flowers before, I thought the arrangement was very nice. It just looked tackier in person than in the photos. I ended up not using it. I did really like my first order and would order it again if it was in stock.